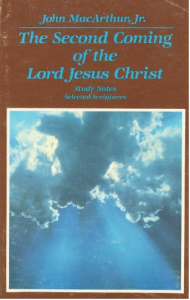 This was an early (1981) Word of Grace Bible Study book. MacArthur, being a graduate of Talbot Seminary, has always been a pretribulationalist though a weak dispensationalist. He writes, “I’m convinced that the correct view is pretribulational. So, when I say that I’m premillennial and pretribulational, I’m saying that I’m committed to the fact that Jesus will come to set up a literal, earthly Kingdom, and that He will come seven years before the Kingdom, prior to the Tribulation” (p. 50).